My co-workers are fascinated with the food I bring to the office. I'm not sure why, it's nothing special. I think it's more that I consistently pack my breakfast and lunch that has them intrigued. They are curious what I find to bring day in and day out. So I decided to start a "Brown Bag" series where I will periodically post what I'm bringing to eat that day. Most of it will be healthy but I do through a treat in there every now and again. 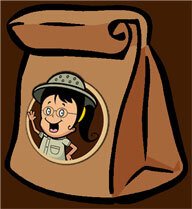 Hopefully you will get some ideas of things you can pack in your brown bag. Toast the oats and pecans in a preheated 350 degree oven for 8 minutes or until golden. In a small saucepan, over low heat, warm your honey. In a food processor, pulse oats and nuts. 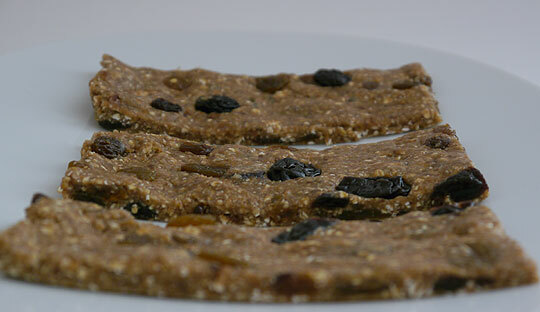 Add the warmed honey, dates, flax meal, cinnamon and salt until mixture begins to form a dough. Scrape into bowl and break up any clumps if needed. Stir in the raisins and cherries. Line a 9 inch square baking pan with foil. transfer mixture to pan and press flat with using wax paper so it doesn't stick. Freeze for 30 minutes. Cut into 16 bars. Great idea for a series! These breakfast bars look amazing - my husband loves dates and I love dried cherries and we both need to incorporate more flaxseed into our diets. Thanks for sharing this recipe. As an ex-co-worker and one that has witnessed first hand the food you bring in for lunch - including leftovers, it is special! I still remember your seafood pasta! Thanks for the healthy breakfast bars, can't wait to try them!